We have so many pictures to hang on the walls!!! Yesterday we found the Ark of the Covenant: a box full of pictures big and small from the Virginia house that had been wasting away in the garage for a year and a half. I can’t wait to unpack my life!!! Okay, I have been waiting, and waiting for this. Not happening. Eat for Free is the weekend before the shower. Womp wah. And as it turns out, that’s a VA weekend for us. However, there IS a silver lining! We had a busy day around here yesterday. My beef isn’t with opening boxes and putting things away. I just don’t want to take everything up and down the stairs. Tom is perfectly willing to take stuff to where it needs to go, but he doesn’t know where that is. Match made in Heaven! I actually emptied one of those under-bed storage containers, which has been full of junk (art supplies and cards and pictures) since maybe high school? Middle school? There was some college junk in there, too, so who knows. Anyway – it’s totally empty now. All the cards are in boxes with other cards. 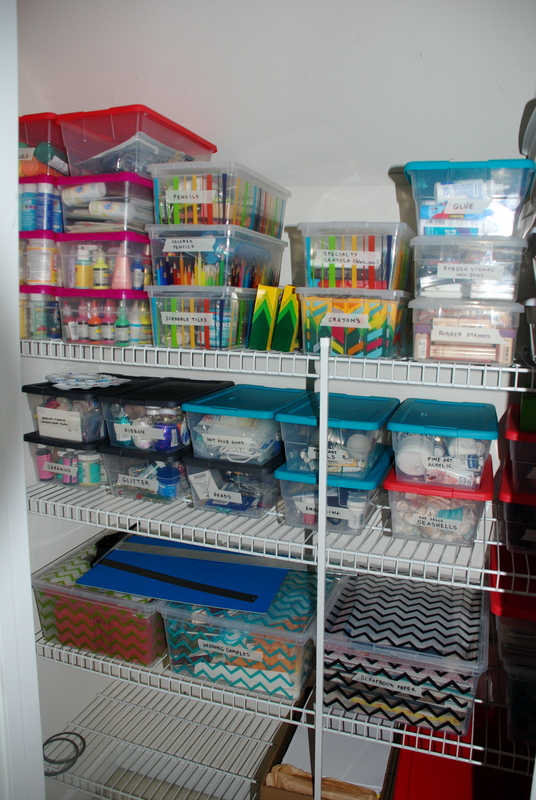 The pictures are in boxes with other pictures and the art supplies are all sorted into their appropriate bins. I told Tom that my Art Closet is a dream come true. I think I’m going to go stand in front of my art closet for a few minutes. Kirk out.